UPDATE: Police took 50 minors to 3rd District headquarters for curfew violations. Authorities said they were picked up in the South Street area. 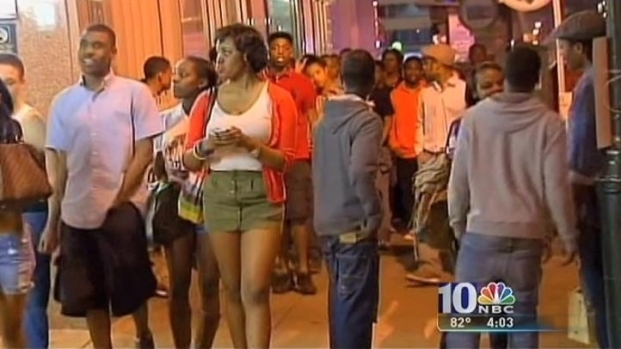 A 9 p.m. curfew for anyone under the age of 18 began in Philly Friday night. The curfew applies to Center City from Bainbridge Street to Vine Street and from the Delaware River to the Schuylkill River. In University City the borders are between 38th and 43rd streets and Market Street to Baltimore Avenue. NBC 10's Monique Braxton reports from Center City, where a curfew will be put into effect in an attempt to curb violence. The teen mobs that have been popping up sporadically throughout the city for almost a year have residents on edge, and on Friday morning Police Commissioner Charles Ramsey took the time to have an open dialogue with the public in an on-line chat on Philly.com. More than 600 people logged onto the chat, according to a police spokesperson, and for more than an hour Ramsey and Deputy Commissioner Kevin Bethel frankly answered the public’s questions. The questions ranged from tourists worried that they should cancel their vacation plans in Philadelphia to residents wanting to know why the parents of these children aren’t being punished. Bethel said in the chat that the average age of kids in these mobs is 14 to 16, but police have arrested kids as young as 11. “The parents have been held accountable for the actions of their children. I have personally attended a few of the cases at 1801 Vine (Juvenile Court). Judge Dougherty has been very proactive in ensuring the parents are engaged in the process. The courts have been very receptive in providing forums for the Police Department to sit down with the parents and children to address this issue,” Bethel wrote. A few people in the forum asked if there will be any efforts to restrict social networking sites because of its role in communication among the teens. “Social networking is not the issue. It's here to stay, it's the latest form of communication, we take advantage of it when we can. It's how people are misusing it in order to gather and then commit a crime,” Ramsey wrote. Ramsey even took the time to give a mini lesson on the U.S. Constitution when one person asked why the city doesn’t keep groups from forming, or limit groups to 10 people. “People have a constitutional right to assemble. It's not the gathering of people, it's the criminal behavior by a minority who use groups as anonymous cover to commit crimes,” Ramsey wrote. “Bears. Without question,” Ramsey replied. Ramsey's force patrolled Center City on Friday. "We need to stabilize the situation but I hope what it does for kids that aren't involved in this sort of thing is that they apply peer pressure to those that are," said Ramsey. "The reason they're impacted is because of the few that are out there causing problems." Other Philly residents gave their own input on how to solve the problem. "I think their parents should make sure that all the kids are home at a certain time," said Carmella Smith. "They should just pack up their stuff and go home," said Kevin Williams. "Play a game, read a book, do something else. This is pointless."